In recent years, there has been a surge of counterfeit coinage on the market, all in an attempt to cash in on rising prices in an established hobby. Back in 2011 a single counterfeiter from China was found to have sold over 100,000 fakes annually, and more and more are being produced and discovered each year. 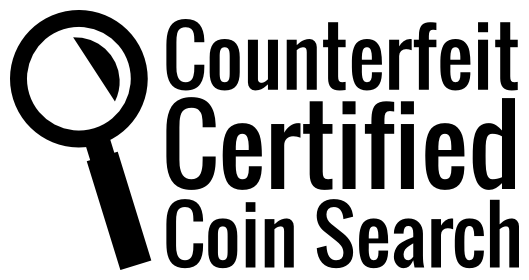 However, the good news is that the vast majority of counterfeits can be identified immediately if you know what to look for and in ways that do not destroy the numismatic value of the coin. 99% of all counterfeits out there do not have the proper weight. This is because they are manufactured out of scrap metal that is usually lighter than coin silver, gold or other alloys employed in coinage. The first thing you should do is weigh the coin and compare it to the known weight of coins of that type. Remember that there is some tolerance and variation. However, if it’s off by as little as a gram, chances are it’s a fake. This method also works for bulk lots of coins. Simply weigh them all at once and compare it to the weight you would expect if they were genuine. If the weight is off, divvy up the pile into stacks of ten and weigh them separately to narrow down where any potential counterfeits might be. Most fakes, since they are made from scrap, tend to be ferric and will stick to a magnet. This is an immediate indication of a fake if a genuine specimen is not made of nickel or steel (both of which are magnetic). Many of the “next generation fakes” from China are non-magnetic. If it doesn’t stick to a magnet, then we can test for a diamagnetic reaction. For this, however, you will need a very strong neodymium button magnet, which you can purchase at most scientific supply stores. Slide the magnet down the surface of the coin. If it slides swiftly off the surface with little to no resistance, it’s likely a fake. If the coin is made of silver, a magnet should slide very slowly over its surface. Be careful not to interpret a false-positive, though, as a magnet will also slide slowly over other metals such as copper, aluminum, and lead; however, it will slide noticeably slower over sliver. Be sure to check the slide with a genuine silver piece of the same fineness for reference. If you do not wish to risk damaging the surface of the coin, this test will work through the surface of a coin flip or a thin piece of plastic. If the coin in question is supposed to be made of coin silver or gold, its ring can be a solid clue. Flip it and listen carefully. Silver and gold have a deep resonant ring, where most counterfeit rings are too high. Your best bet is to compare the sound to a genuine piece for reference. Fakes tend to be poorly struck. If the coin has a very strong rim, indicating that it was properly struck, but the details are lacking in odd places (that, for example, aren’t indicative of a coin struck through grease or other minting error), chances are it’s a fake. If you’re looking at a coin, that if it were genuine would command a large price (such as a key date) compare it to pictures that exist of genuine specimens. Make sure all of the features are where they should be, that the date is properly formed, and that the mint mark is in the right place. Fakes often have poor luster or, with steel-based alloys, can rust (coins made of silver, copper or nickel do not rust, but corrode in different ways; gold coins do not tarnish). Check the edge of the coin for proper reeding or edge lettering. If it’s absent, or different than expected, it’s very likely its a fake. Some overseas fakes even have spelling mistakes, so keep your eyes open. If you’re still not sure you can always submit the coin in question for Attribution.